Shireen asks: I am a 35 year old woman. I've noticed a pattern that I get weird, and vivid dreams a few days before the commencement of my period. I do not exactly get nightmares and wake up feeling frightened or something of that sort but I do get bad dreams like being in an anxious situation or being chased or roaming naked in a public place. Sometimes, the dream is about the loss of a loved one. At times the dreams are extremely hazy, bizarre and muddled. Do other women also experience this? Any idea why this happens? Shireen, what you are experiencing is not so uncommon. 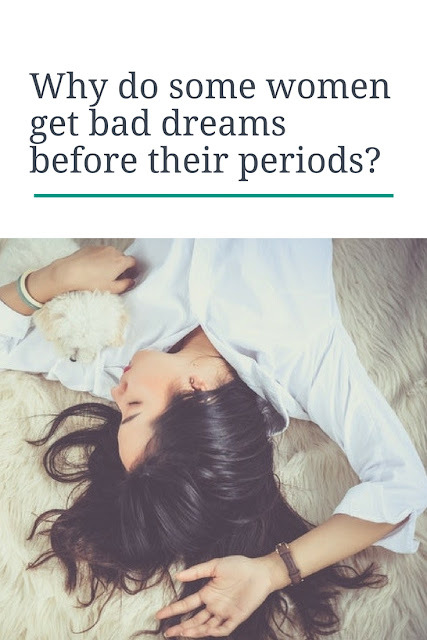 Having bad or weird dreams before a period is one of the many vague symptoms of PMS (Premenstrual Syndrome). Besides the common symptoms like bloating, cramps, irritability, mood-swings, breast-tenderness etc, many women have trouble falling asleep and exhibit insomniac symptoms around this time. The symptoms can range from inability to fall asleep in the beginning , waking up in the middle of the night and not being able to fall asleep again, getting bad, weird or muzzy dreams to fearful nightmares. A study conducted by Jenny Parker from the University of West of England has found that women experience far scarier nightmares than men because of changes in their body temperature. Changes in a woman's body temperature caused by her monthly cycle are responsible for increasing the number of vivid and disturbing dreams. A woman's temperature usually rises after ovulation - half way through the monthly cycle -- and falls again just before a period starts. Dr Parker said that there was evidence linking dreams to temperature changes in the menstrual cycle. 'Women who are premenstrual tend to dream more aggressively, and they are also more likely to remember the dreams,' she added. Dr Parker's study also found that women's dreams were more emotional. She also identified at least three distinct types of nightmares that women usually experience . One involves being chased or hunted. Another involves the loss of a parent, child or partner and the third involves weird and new environments. Dr Parker believes that nightmares help the brain 'rehearse' distressing and disturbing events that one is likely to encounter in the future. By the way, check what some dreams could actually mean from here and here. If your sleep disturbances and dreams during PMS aren't too significant to affect you, you need not consult a doctor. You can manage it easily with some lifestyle changes. Read Home Remedies for PMS. Stick to an exercise schedule, drink adequate water and avoid dehydration, eat nutritious stuff, avoid eating too much of spicy food, steer clear of caffeine and alcohol, practise mindfulness, pray, meditate, develop a hobby and try to manage stressful situations with composure. (Read Beating Stress - Some tips, Fight stress with leisure, Get rid of that worrying problem, Pranayama to release stress) Do not read sensational stuff or watch horror movies, especially before going to bed. Do not use your smartphone, tablet, or computer or watch TV 1-2 hours before hitting the pillow. However if the symptoms you are experiencing is unmanageable, you need to talk to a gynaecologist, endocrinologist and maybe even consult a psychotherapist for resolving your issues.